While going through horrid adolescence, I not only was trying to find my identity but an even harder task I thought was defining myself through my music. A bunch of us formed a band together; Kevin, Jared, Gerrard, Jason and myself. 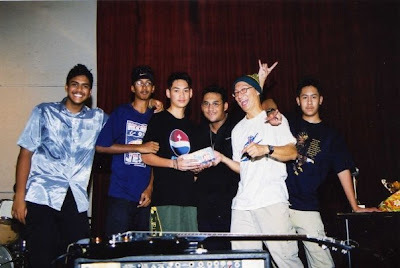 We were heavily influenced by the likes of Greenday, Incubus and Limp Bizkit at this time because of how cool we thought it was to be a rebel (Limp Bizkit: My generation). We were about 14-15 yrs old. We often skipped church, and hung out at the jam studio (Black Widow) playing these covers and discovering our own strengths musically. Still remember how Jared could barely keep a beat and Kevin kept struggling with chords. Me? I was quite pro by then, constantly tuning the guitars and keeping the rhythmic aspect of the band. Later on that year, think it was 2003? There was an ad in church, hosting its first ever talentime contest for Lifeteen Youth Ministry. We were quite active in church. It was good excuse to get out of the house and hangout late on Saturdays. Usually meet up to play football or jam. SO we decided what the heck! Let's give this sucker a shot, and to our amazement, out of the 5 other talented / music-schooled kids and bands that took part? We brought the house down and won first place! I cannot begin to describe the sensation and emotion that was running through my entire body when I was on stage that day. At that very last millisecond, between us huddling close together and praying to God, this nobody/amateur band we were and the Emcee just about to announce the winner. I knew this moment is exactly what I'd been looking for, this adrenaline is my new objective in life and I cannot stop until I find that one feeling again. Lol.. although we sorta disbanded after everyone's interest started growing and wavelengths were no longer the same. Kevin, Jared and I kept keeping it together for as long as we could but you can't start a fire without a spark anymore, and we knew that spark wasn't sparking anytime soon. We did however make front page of a local youth pullout in the News Straits Times that year, just the three of us. Think it was called youth quake? That was I guess our peak ever! After that I was in search again, for something else that could keep my passion burning. The Search for The Adrenalin Rush was on!